My friend, Tracy Hughes, issued a dry fire challenge this month to the members of the League City A Girl & A Gun Club chapter, where she is the facilitator (among the many hats she wears!). 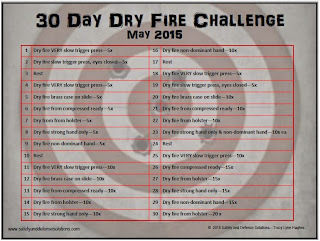 The challenge is simple: one full month of dry fire, six days a week. She's even provided a helpful graphic with each day's prescribed exercise. I'm really excited by Tracy's challenge because I know how well dry fire worked for me. Almost exactly two years ago, I celebrated breaking 50% on a USPSA classifier, meaning I shot it about half as well as the best person who's ever shot it. Earlier this month, I shot a classifier that's predicted to be within hundredths of a percentage point from 80%. How did I get here? I'm not a naturally talented shooter. I don't get to the range a whole lot to practice. But I do dry fire. I dry fire or shoot (live fire practice or match) 5-7 days a week. That includes days we go out with friends or run errands after work, days when I'm stuck in the office late, days when I want nothing more than to crawl into bed right after dinner...I take a night off if I'm sick, if dry firing means I can't get my minimum amount of sleep to function, if I'm traveling, or occasionally if I'm busy packing for a match. And with that last one, I'll probably sneak in a few minutes of trigger control work anyway. I've settled on 30 minutes for my dry fire sessions. A half-hour straight through is a bit longer than is often recommended, but it's a chunk of time that works for me. Occasionally, I'll add an extra 15 minutes if I want to make sure I get in some time on a second gun, but 30 minutes is about as long as I can stay on task and not overwork my body. But even 5-10 minutes would do. To keep myself focused, I set a timer and use a dedicated space. My laptop and cell phone stay out - it's just me, my gun, my session timer, and my shot timer. I've built a plan that I follow if I don't have something specific I want to practice. That way, I never wonder what I'll do in dry fire on a specific day. My plan includes specific exercises, including par times and other goals. I want to leave my thinking for the actual work I'm doing in my dry fire studio, not for figuring out what that work will be. The plan also forces me to do things I'm bad at or haven't thought of before, not just blow through some feel-good drills. 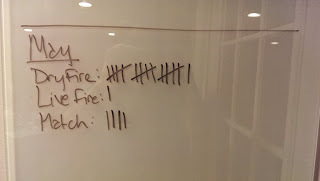 I track and journal my dry fire, so that I can look back and tell you what I worked on last week or last month, and what challenges I had or details I noticed that helped me hit on a new or better way to do something. My trackers and journals also create accountability because they don't lie on how much I have or haven't done, and can be used when checking in with my training buddies. Plus flipping back to old entries can be really motivating when I see how far I've come. 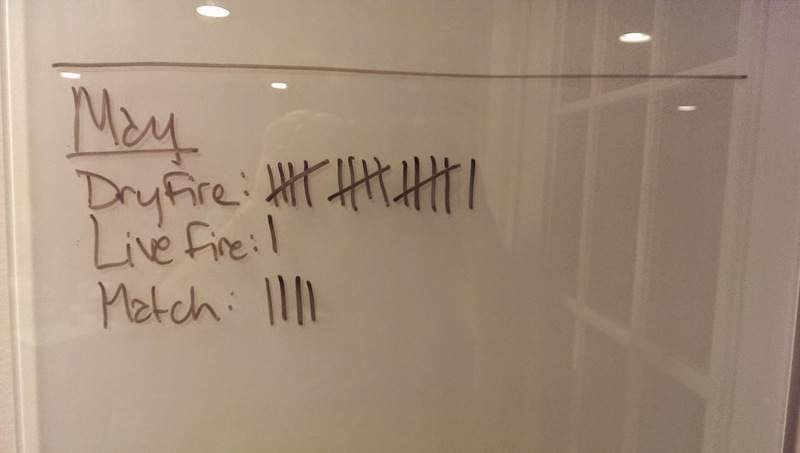 I participate in the occasional dry fire "throw down", where one of my training buddies will post a video of a dry fire drill performed under par time, and challenge the rest of us to match it...on video, of course. The drills can often focus on more obscure skills or push heavily into the limits of what's physically possible. It's fun and I learn a lot about the skills in the drill, since participating often includes lengthy discussion of the specific techniques that make it possible to perform the drill as described or refine performance even further. I push my dry fire practice until I fail, then I figure out what went wrong and fix it. While perfect practice is important, so is going hard until the wheels fall off. Dry fire, in a safe environment, is where you can find out how fast you can go, whether or not an odd technique will work for you, or if your bright idea about how to do something really is so bright. And having that safe space means I can make a skill mine even if it didn't seem so hot the first thirty times. Three hundred. Whatever. It doesn't cost me anything but time to figure it out. One of my mentors and coaches describes dry fire as shooting with everything but the bang. Or rather, shooting live ammo is just dry fire with a little more noise and recoil. While you can't replace every bit of the shooting experience in dry fire, you can do most of what matters. 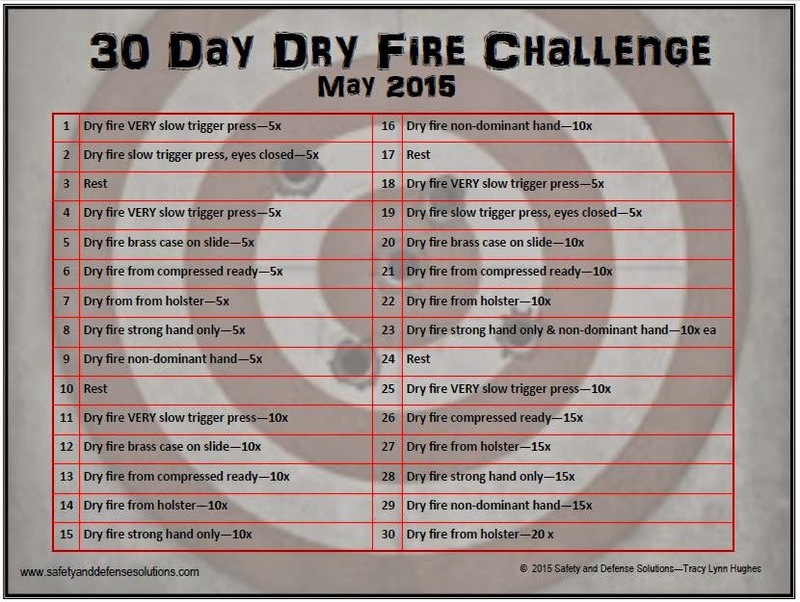 All that work you do in dry fire? That's what's behind making your shooting beautiful.